We believe that having a learning difficulty and/or disability should not be a barrier to achievement. Indeed, some of our best academic results are achieved by pupils who have a learning difficulty. The Learning Support Department offers support for those pupils who have a learning difficulty and/or disability, including those with a Statement of Special Educational Needs. The Department aims to offer such pupils the appropriate support tailored to their individual needs to ensure they achieve their full potential. Most learning difficulties will have already been identified before a pupil joins Mill Hill. However, a literacy screening test is carried out in the first term of the Fourth Form to check whether any pupils have an unidentified learning difficulty. Where appropriate and in full consultation with parents, further assessments are carried out and the Head of Learning Support makes appropriate recommendations. With the agreement of the parents, pupils with a learning difficulty are included on the School’s Learning Support Register. The Head of Learning Support advises all teachers on the specific individual needs of each of the pupils on the Register and monitors their progress throughout their time at Mill Hill. Regular contact is maintained with parents. The type of support offered to a pupil is tailored to their individual needs, and may include in-class support, individual and group sessions focussing on literacy, study, revision and organisational skills. Other specific subject areas may be covered as required. Particular attention is also given to ensuring that examination access arrangements for pupils with learning difficulties/disabilities are correct and comply with the Joint Council for Qualifications. 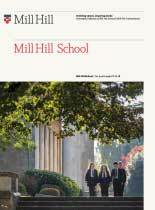 For more detailed information regarding Learning Support at Mill Hill School please contact the Head of Learning Support, Lisa Silverman on 020 8906 7941 or email lns@millhill.org.uk.